For sowing-in, sowing-after or sowing-under the P-BOX-MD is an optimal machine. With its compact construction, the P-BOX-MD can be built onto on almost all machines (Disc Harrows, Cultivator, Crosskill roller, etc.). With the P-BOX-MD you can distribute all seeds and mixtures up to a size of 5 mm depending on the quantity and working speed via simple adjustment between 1 kg and 300 kg / ha. The 300 l seed tank can upon request also have a volume of 500 litres. A stirring shaft prevents the de-mixing as well as the bridge building in the tank. 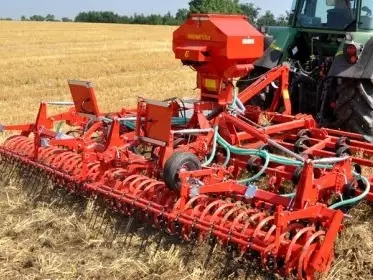 The flexible drive shaft, connected to a rubber or tail wheel drives the stepless gearbox, which runs the seeding roller and the stirring shaft via a chain. Consequently the seeding shaft brings the seeds in the air canal, where it is, depending on the size of the machine with help of the air amount of an electrical, cardan shaft driven or hydraulically driven fan through plastic hoses, brought to the distribution plates. The especially formed deflector plates guarantee also with wind an exact distribution of the seeds. to prevent azote from being washed out the inter-crop seeding in tillage is getting more and more important and is obligatory in water-protection areas. The seeding of inter-crops should be done immediately after working the soil in order to utilise the humidity in the soil. due to weather conditions or mistakes in cultivation the balance in the grassland can be disturbed. The non-turning improvement of grassland provides excellent ways to improve the situation. After one or two combing passes, the oversowing of clover is possible in the 3 to 4 leaf stage. During the autumn and winter, before ploughing for the summer grain, a successful establishment of clover in grain can contribute as much as 100 kg of nitrogen. Green fields following grain harvests are considered very beneficial ecologically due to the good nitrogen balance they provide.